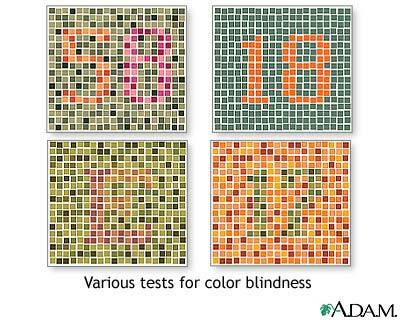 The following are common tests used to detect color blindness. Can you see the letters or numbers hidden in each square? You should see 58 (upper left), 18 (upper right), E (lower left) and 17 (lower right). If you cannot see any of the above numbers/letters, you may suffer from color blindness.